MoonMarble.com - Joshuah Justice - "Rainbow UV WigWag Marble"
Art Glass → Contemporary Handmade Marbles → Joshuah Justice - "Rainbow UV WigWag Marble"
Joshuah Justice - "Rainbow UV WigWag Marble"
Handmade Contemporary marble by Joshuah Justice. 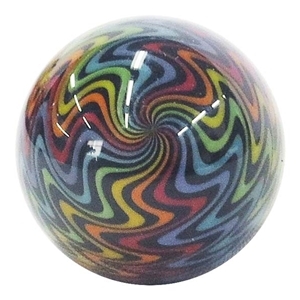 This marble has an intricate wig wag design in a rainbow of opaque colors and black lines. Also includes glass that glows under a UV light. Approximately 1 1/8"+ in diameter. Signed. Fritz Lauenstein - "Beach Ball Marble"
Joshuah Justice - "Bee UV Spiral Marble"